Skylight windows are typically hard to reach and can be tricky to measure. Below is a helpful guide to getting perfect measurements for your skylight. Blinds.com knows that the perfect fit for a beautiful new window treatment all starts with an accurate measurement. If you’re planning a DIY window treatment project, our How to Measure for Skylights guide makes measuring easy! Measure to the nearest 1/8 inch. Never round up or down to the nearest half or whole inch. Side mount is not available for cellular skylights. When assessing mounting depth, take into account any obstacles that may be in the window opening, such as window cranks or handles. These can prevent you from mounting a shade properly. Side tracks must be mounted for both inside mount and outside mount, except in cases where the shade doesn’t come with side tracks. Check to see if your skylight has enough depth for mounting. Skylight window coverings typically need a minimum depth of 1 ½” to install brackets and mount the product. Width: Measure in 3 places: top, middle and bottom. Measure from edge to edge inside the window opening at the spots where you plan to place the mounting brackets. Height: Measure in 3 places: top, middle and bottom. 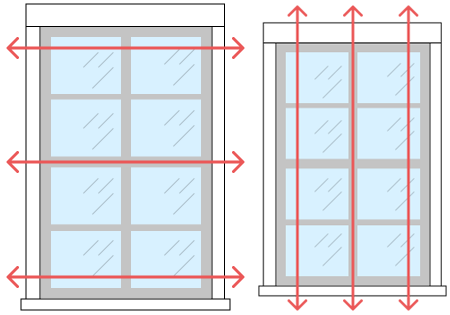 If the window height is more than 96", measure the width every 48". Taller windows may need extra mounting hardware. Order your product at the narrowest width and the shortest height. Use the exact measurements, taking no deductions. The factory will apply the necessary deductions when making your product. All corners of the window must be 90 degrees. If not, you will have to do an outside mount. If the window is out of square by ¼” or more, you will have to do an outside mount. 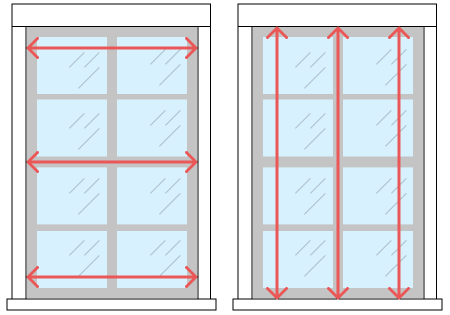 To find out if your window is out of square, take both diagonal measurements, from one corner to its opposite. If the difference between the two is ¼” or more, the window is considered out of square. For outside mount skylights, you need at least 1” of flat surface on all sides of the window. Width: Measure the width of the opening at any location on the window. Add 2” per side, for a total of 4”. This is your width measurement. Height: Measure the height of the opening at any location on the window. Add 2” to the top and bottom, for a total of 4”. This is your height measurement. Order your product at your exact measurements, taking no deductions. Your product will be made at the exact size you order it.